Finding the best bow saw on the market is not always as easy as it might seem. The main reason why I am saying this is that I often found myself overwhelmed by the variety of tools available on the internet and on the market in general. Why should I chose an Irwin saw over a Bahco one? Or why should I invest more on one and not on the other? Luckily enough for you, I invested some of my time for searching the market and making this selection so you won’t have to. From affordable to fancy I tried to make a fair selection and include most reputable brands that rarely disappoint with the quality. I would say the most important would be the blade sharpness and the structure of the saw. Because without these two you cannot make clean, fast and hassle free cuts. Quality is always important and I value the quality of a product more than the affordability. I often guide myself by the saying “You get what you pay for”, and that is also how I made this selection so far. By ease of use, I mean a good handle with a good grip and a form factor that allows you to make a clean and easy cut without too much hassle. The process of cutting wood should be, at least in the 21st century straight forward. If you pay a certain price for a bow saw only to find out later that the replacement blades are almost as expensive as the saw itself then you have a problem. I tried to only include items that offer good quality replacements at a decent price. But enough with the talk, let’s see which is the best bow saw for your needs! This bow saw is both one of the most popular and quality ones on the market that I managed to find. It is absolutely stunning what a good value for the money and quality you get in this price range. It is made of steel in Sweden or Portugal, and it seems they did a great job by delivering extremely sharp teeth and a strong structure. I absolutely love the handle for offering a good grip when cutting. You will cut through dry and green wood like through butter. It is pretty impressive what a razor sharp set of teeth and an intelligently designed handle and form factor can do. It will most certainly ease your work and make it more satisfying. It is flexible, it is easy to find replacement blades, the blade tension is perfect right out of the box and it comes with a plastic protector for keeping the blades perfectly sharp. The only thing you should think of before buying this saw is its relatively big size. This is by far the best bow saw you can buy for the price in my opinion. Look no further if you want value for the money, quality, and durability, all in an affordable saw. If somehow the previous model did not convince you, this should probably do the trick. It is sharp, it has a great tension system and it is reliable. All of that for a reasonable price. You can choose from the available sizes of 21, 24 and 30 inches depending on your needs. The handle is pretty basic although it offers a pretty good grip. While I still prefer the handle and form factor of the Bahco above this one is still pretty good. As long as you do not compare them like that you will not know the difference. The blade is good although not excellent. It is sharp enough for both dry and green wood. This is just a personal opinion but I think the blade is not the most durable you can find. I have seen some people complaining about it. Yes, the replacement blade is kind of cheap but then you may question why to invest this amount on this saw and not pay much less on a version from underneath this model. 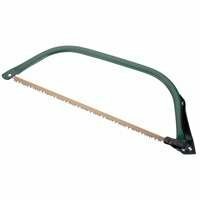 Again, I am not saying this is not a great bow saw, it is actually easy to use, well-manufactured for gardeners and everyone with a backyard. I would keep one of these in my garage at all times, just in case. If all you want is something cheap to get the job done, then I would choose this Gilmour bow saw. It is true that it has certain flaws but at this price I can’t think you would expect perfection. The handle is mostly inexistent except for a metal plate. The manufacturer says that the blade has a self-adjusting tension. And that is true, but the overall wood cutting experience is not the greatest. The manufacturer also says that the saw has a comfortable “hand grip” which is not even remotely true. 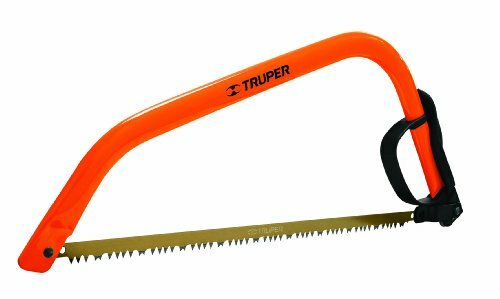 If you want a compromise version of a bow saw then you can pick this one without worrying that you will lose a lot of money if the blades fail at some point in the future. My advice is to spend a little more money on better ones but ultimately it is up to you. This is by far the cheapest bow saw I could find that still respects a minimum of quality standards. While I wouldn’t even compare this Mintcraft saw to a Bahco I still think that you get good value for the money. The blade is acceptable although I highly doubt it will resist in the long term, the structure is typical and the handle is inexistent. Of course, you can always buy replaceable blades in advance just in case, although I don’t like that and I wouldn’t do it. There is really not much else to say about this item. 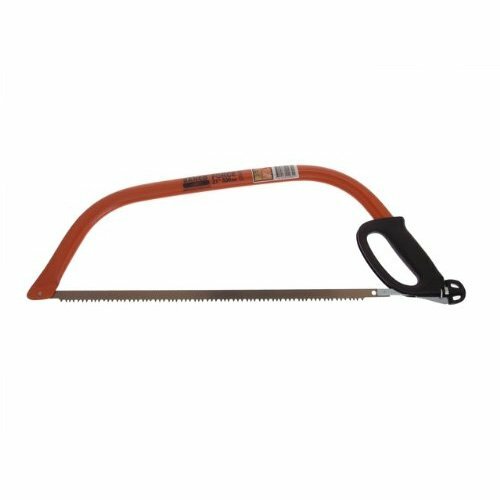 It is definitely not the best bow saw in terms of quality and ease of use, but in this price range, it is easily the king. If you want something very affordable then this is a good pick. This is the bow saw with the most narrow angle among the ones I reviewed. It is yet another very affordable saw that offers great value for the money and acceptable quality. I couldn’t cope with the lack of a good handle but if that’s not so important for you, then you won’t feel it as an inconvenience, especially as long as you don’t compare it with others. While it was made for one-handed use, you can always use both of your hands if the wood is too thick and need more force. Although that might damage the teeth, so I won’t recommend it. If you want to spend less to get more this is the bow saw I would recommend. Check out my review on the best crosscut saw if you need one. Also if you need to cut metal or plastic pipes, I wrote an article on the best hacksaw.